Spokane County’s native tree is the North Plateau Ponderosa Pine (Pinus ponderosa var. ponderosa, Douglas ex C. Lawson). Trees from Montana growers may be Rocky Mountain Ponderosa Pine (Pinus ponderosa var. scopulorum), growers in Oregon and Western Washington may sell you Pacific Ponderosa Pine (Pinus ponderosa var. benthamiana). Be sure you’re buying OUR Ponderosa Pine, it’s acclimatized to our region at maturity and improve your final product! For an in-depth description of the species and it's subspecies see this great article on Wikipedia. At no time should you allow the root ball of a Ponderosa Pine to dry out or otherwise suffer from stress related to water loss. This is the number one reason for new planting mortality. Ponderosa Pine should be treated like Arborvitae prior to planting; they are extremely sensitive to water stress until established. Because of the sensitive nature of Ponderosa Pine water intake during establishment it is vitally important that tree stock has an adequately developed and prepared root ball. Root collar set too deep in the ball. J-roots (roots planted with a bend). The majority of Ponderosa Pine tree stock is field grown then balled and burlapped just prior to shipping. The typical Ponderosa Pine root structure consists of a tap root and lateral roots roughly 20” below the surface. Commercial nursery field digging is usually done with a hydraulic tree spade. 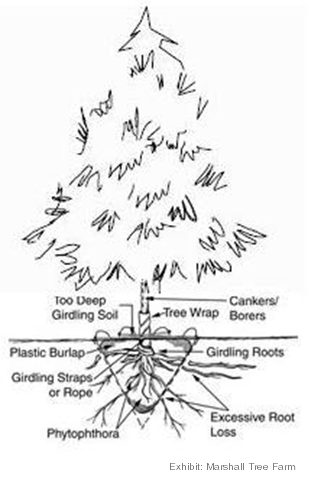 Tree spades dig a conical shaped root ball cutting off the trees tap root and lateral root structure. Field digging removes the majority of the tap root and much of the root structure. Use of the field growing and digging method shows how vitally important it is to keep the root ball watered throughout the transport and replanting process. If available, we suggest the purchase and installation of container grown Ponderosa Pine that have been alowed to grow feeder roots in their container. Another alternative is to containerize B&B Ponderosa until they re-grow feeder roots to better survive placement in the landscape. This is a common practice by the City of Spokane Urban Forestry Department which has had a substantially improved survivability rate with their Ponderosa Pine. Ponderosa Pine is the number one issue tree for contractor warranties in our region, but tree mortality is preventable. In most cases, mistreatment of the root ball is to blame. Contractors must demand trees with good quality root balls from the growers. The contractors should always review tree stock quality prior to acceptance. The root ball must not be allowed to dry out. Large plant stock should be planted in the spring for best survivability. See an example of an evergreen tree planting detail here.